Upload the su-wc-sms-notifications folder to /wp-content/plugins/ directory via FTP. Upload the full ZIP file via Plugins > Add New > Upload on your WordPress Administration Panel. Search WooCommerce SMS Notifications in the search box on Plugins > Add New and page press Install Now button. Activate the plug-in through Plugins menu on WordPress Administration Panel. 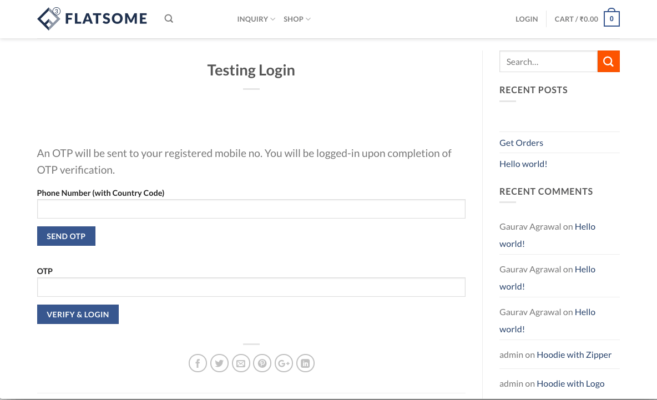 If you have not obtained the credentials yet, purchase a WooCommerce SMS Pack from (https://mtalkz.com/product/woocommerce-sms-plugin/) and you will receive the credentials in email. You can use any of the standard variables in the SMS templates. Further, if there are other meta variables associated with the order (defined by some other plug-ins) then you can include them in the Custom variables box (one variable per line) to use them in SMS templates. You can also define a Signature, which can be appended to a SMS by using the special variable %signature% in the template. 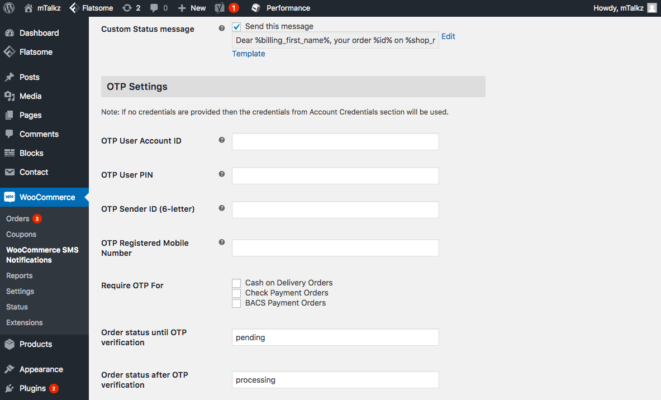 For each stage of a WooCommerce order, you can select whether to send an SMS notification to the customer, and the template to use for the SMS. Note that, New Order message is sent to the store owner, whereas all other messages are sent to the client. You can change the message template by using the Edit template link and then sending the revised message for approval to [email protected], once its approved you can paste the revised message in the respective box and save to use. If you have set-up your WooCommerce store to have any custom order status(es) – via some other plug-ins, then you can also set a message template for all such custom order statuses via Custom Status message box. Here, you can also set OTP settings. You can use a different set of credentials to send OTP, or leave the fields empty to use the same credentials as in the first image. In addition, you can also select the order status during OTP verification, and post OTP verification, which will default to pending and processing respectively. 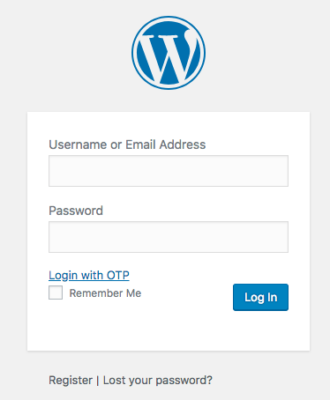 You can also use OTP verification for User Registration and Login. If the fields are not visible on registration form on your site, then please clear the cache. If the issue persists, then add the following code to functions.php of your theme. Here, the users need to enter their registered billing phone number (with country code) on which they will receive an OTP. Post receipt, they can enter the OTP in the second box to login to their account associated with the mobile number. 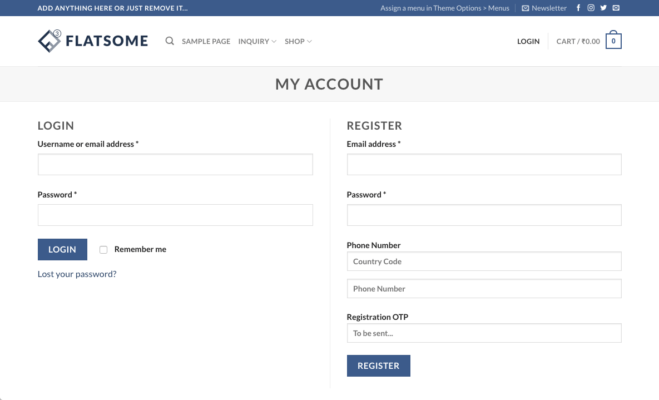 You can style the form anyway you like, or include it in a lightbox pop-up by adding appropriate code as per your website’s theme. This entry was posted in BLOG and tagged Plugin, woocommerce.